Act now and take advantage of a 20% discount on New Zealand 'Estate' Sauvignons from SundayTimesWineClub.co.uk. Check out SundayTimesWineClub.co.uk and you can find sauvignon from as low as £3.33 per Bottle. 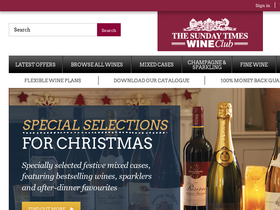 Right now when you purchase select cases of wine from SundayTimesWineClub.co.uk, you'll get a Free magnum of wine. Buy mystery cases of wine filled bestsellers and award-winners, and fully guraanteed. Cases start at just £55. Save £39 when you join the Wine Club. See site for details. Sign up for the 4 Seasons Club and save £50 and receive 15 bottles a season. Click link for details.